It’s not generally well-known, but tall bikes have been around since the late 19th century. In the age of gas-lighting, it could be a slow and arduous task to move from lamp to lamp with a ladder and torch. 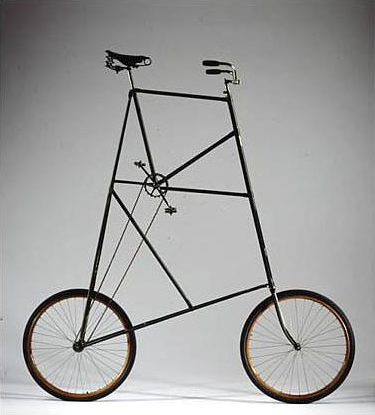 In 2001, Sotheby’s sold this bike, constructed in 1898, for $US 24,000. It was used to light lamps, and probably made the entire process about 5 times quicker. Made of tubular steel with 28″ wooden rims. Understandably enough, this is a favourite with bike bloggers. Thanks to tubulocity for the photo. Found on Flickr. 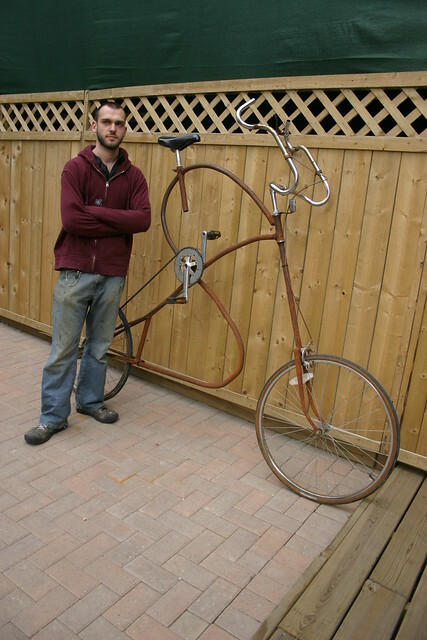 The caption reads: Lloyd and his tall bike. Made with just a jig, a pipe bender, and a small MIG welder. Usually when people build tall bikes, they stack frames from smaller bikes and it looks retarded. Lloyd built this frame from scratch! This entry was posted on Thursday, January 26th, 2012 at 8:39 am	and tagged with tall bikes and posted in Uncategorized. You can follow any responses to this entry through the RSS 2.0 feed. don’t you dare get one.